DEATH play Dublin next Wednesday. See exclusive footage from Vienna show! 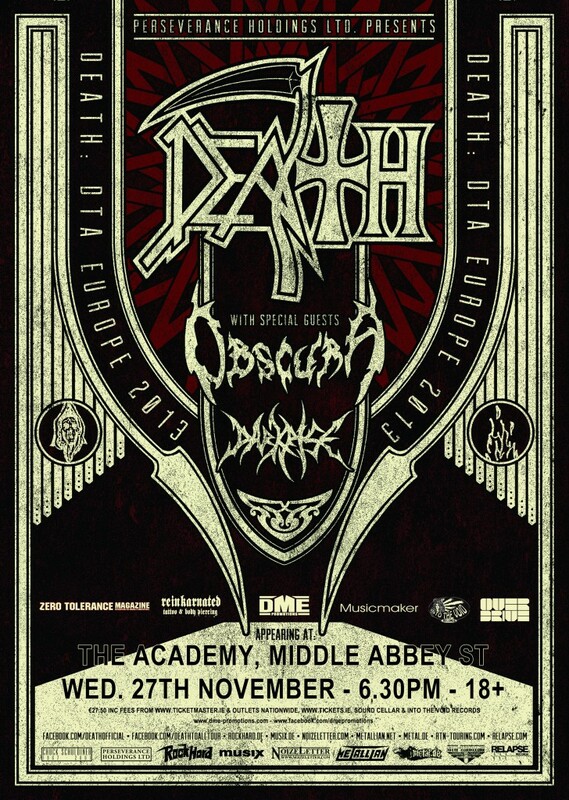 One of the most influential and inspiring heavy bands of all time DEATH, will be performing in The Academy on Wednesday 27th of November with OBSCURA and DARKRISE. Continuing the legacy of founding member Chuck Schuldiner who unfortunately died of brain cancer in 2001, the current DEATH line up consists of “Human” legends Sean Reinert (drums), Paul Masvidal (guitars) and Steve DiGiorgio (bass). Max Phelps – some of you will have seen him performing live with CYNIC – will step in Chuck`s footsteps. This amazing tribute line up will perform songs from every DEATH era and should not be missed! Tickets for the show are now on sale from Ticketmaster, Tickets.ie. Sound Cellar and Into the Void. For more information, please head over to DME Promotions. Check out some fan footage from DEATH live in Vienna just four days ago. *Camera is shaken for the first few seconds and then good quality.